Back in September, i was asked to write a post for Ocean Loans about how i like to relax and what i would do in a typical day to relax. Relaxing is very easy for me, i don't get stressed and i think I'm quite a relaxed person. I am happy when I'm just relaxing at home on the weekend and perhaps popping out for lunch with my parents. I was given £50 to spend on treating myself to relax. First thing i have to have it candles. Candles really change the mood and for me they just make everything so much more ambient and pure. After a hectic day at work, i love coming home to my bedroom and lighting a candle. I find it really helps me to unwind and forget about my woes and any negative energy is helped to go. I think I'm a naturally positive person, the glass is always half full and i like to think that theres a good in everything and everyone (even though unfortunately for some there isn't). For me, life is way to short to be negative and worry about everything. Of course there are things that i do worry about and i do get nervous/anxious very easily, but i have taught myself how to deal with these things and try to be positive, even in a bad situation. The next thing i have to have is a good film or TV programme to watch. Typically, i will relax more the evenings then in the day, but thats just because during the day, particularly weekends as i work during the week. Sometimes i will just sit in my room all day, but thats how i like to do things. I don't like being busy, as i just can't cope with it and i prefer my own company to others, which people find really weird, but thats just me and how i like to live my life. Everyone is different at the end of the day and for me, as i don't have many friends (even one hand doesn't get filled) I've learnt that my own company is the best, as there is no drama and i don't have to pretend to be someone I'm not in front of certain people. I don't like pretending to be someone I'm not and agreeing with everything everyone says, but in a recent situation, i found that i was doing this just to please people and I've put my foot down now. You can't let others dictate your life and make you someone who are aren't. If you are not happy with the way your acting or being made to be, only you can change that and don't be scared to have your own opinions. Anyway, sidetracked. I do get bored very easily though, so thats when its time to annoy everyone in my family. I am a massive disney sucker, so anything disney, particularly the old school disney films are the best one. At the moment, i am loving Elf, purely because its nearly christmas and I'm so not in the christmas mood this year. Finally, the one thing i have to have when watching a film is a can of pepsi max and a chocolate cookie. So simple, easy and god darn delicious. I hope you enjoyed reading this and i would love to know how you like to relax. Have a great day and thank you for reading! Packing my makeup for a short break is a nightmare. I want to take all of my makeup and skincare with me, but obviously i can't. As i have so much makeup, narrowing down the items isn't exactly easy, especially when it comes to lipsticks. I really don't need 5 shades of red, but apparently, i think i do. I recently went to Egypt and i was pleasantly surprised at how little i took and i still didn't use it all. As i have started to become pretty good at selecting items i know i will need to use, i thought why not share my tips and tricks on what to pack for your holiday or short break. So here we go with 4 top tips. Palettes are the best way to get multi uses out of makeup. Whether its just an eyeshadow palette or a cheek palette or even a cheek and eye palette. You can get multiple looks, using one palette. Also, you can create many different looks with one palette so you don't need to take 6 palettes and 14 separate eyeshadows. I have a MAC one which i love taking away, as it had a blusher, 4 eyeshadows and 2 lipsticks and i can create many different looks with it. I am most probably the worst at this. I look at items and question whether i would use. Obviously the answers yes, even though i know I'm never going to wear that bright pink lipstick during the day or even the evening. Only take the basics and then worst comes to worse, you can buy items abroad if you going for a city break. If your going to a hot country, do you really need a full coverage foundation for the day? In my eyes no, a light tinted moisturiser is perfect for both day and night times and will allow your skin to breath. This is the one i find the hardest. I have so many brushes and i wish i could take them all, but that is somewhat unreasonable and unnecessary. I like to take normally around 5 face brushes and maybe 5-8 eye brushes. I take around 3 blending brushes, sometimes 4 because girls, there is no harm in extra blending brushes. Ever. I then will just have a flat eyeshadow brush, angled brush, a small detail brush and then an angled fluffy brush. When it comes to face, i rarely wear foundation, so i just take a buffing brush, just incase i am feeling a change. Then a contour and highlight brush, powder brush and then a larger contour brush to use for bronzer and to blend everything out. I could most probably narrow this down more, but the last thing i want is a non blended eye. Not cute. Small. Go small. A big bag tells your brain to fill it. A small bag will help you to pack less and then you will restrict yourself on items that you really only need. I have the cutest Paul & Joe makeup bag, which is like a makeup filofax. It has an area for your brushes and then 2 removable pouches for any other items. I struggle to put even the smallest in here, so its great for making me choose what do i really need and its also really cute to look at in the morning. So, there we go, my 4 tips to packing lighter with your makeup. Of course, this can apply to your skincare as well. You could try it with your clothes, but I'm not to sure how well it would work. As i am of to New York on Friday, i plan to take as little makeup as possible, so i can buy a lot out there. Thats also a great tip, although not sure i need anymore, but never mind. I hope you all enjoyed this post and had a lovely weekend. Thank you so much for taking time to read this and be sure to follow me on instagram to follow me around NYC. Thank you for reading! If you follow my instagram, you will see that 90% of my pictures are of my room. Ever since I've gone from a bright turquoise that gives you a headache every time you looked at the wall, to a simple white room with pops of colour, i have loved documenting my favourite parts and taking photos of it (I've just bought a phone case and 50% of the pictures are of my room). Recently I was asked to do a post based on my valued possessions based on this article. I was recently asked to do a post/video all about my valuable possessions in my room. My room is a like a secret box. Although it may look pretty empty, i have lots of storage which hides all my little bits and bobs. Under my bed, for example, is where all my jewellery is. As i have a room the size of a pea, i can't have everything on display, so most of my valuables are hidden either under my bed or in my wardrobe. I would say that my most valuable items are the most expensive items, but they are the items that mean to the most to me. For me, this has got to be my polaroids, purely because if i loose them, they are forever gone. I can't get the same picture twice and i can't copy or change or edit them which i love, but also hate at the same time. I display mine on bunting around my fairy lights so i can look at all my happy memories that I've had. Another valuable and this one is a bit more on the lame side is just my bedroom furniture. I love my bed. I love my bed so much and the fact that its custom made just for me, makes it so much more nicer. Its not just my bed though, i love my bedside table, my dressing table, especially my dressing table. This is where all of my makeup is kept and if this was to ever go missing or disappear, i don't know what i would do. I have a stupid amount and sometimes i want to sit down and work out how much it would all cost, but then i would just realise how much I've actually spent and cry for a bit. So, there we go. I have lots of valuables in my room and i love them all. Ranging from keepsake photos, to jewellery, to makeup up and furniture, i love them all and are my valuable possessions. 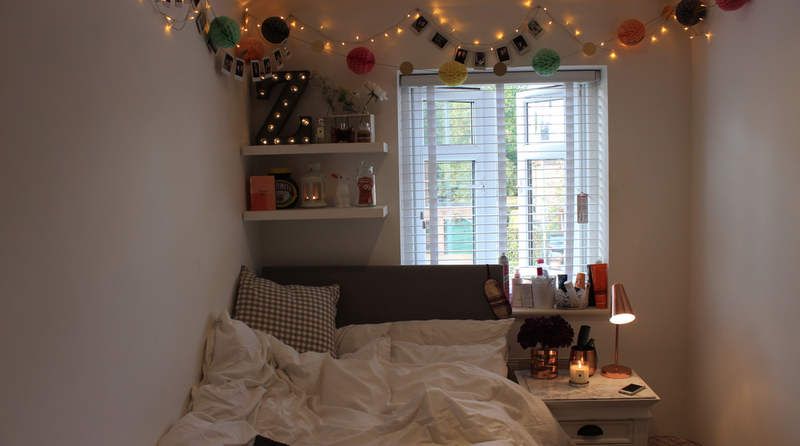 I have also done a video (linked here), just to show you a more in depth view of my room and my favourite items. I would love to know what you valuable possessions are and i hope you had a lovely weekend and thank you for reading!